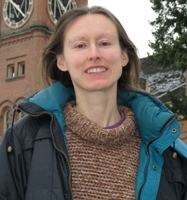 Klára Briknarová came to the University of Montana in November 2005. Klára received her undergraduate education from School of Mathematics and Physics at Charles University in Prague, Czech Republic. She carried out graduate studies in the laboratory of Professor Miguel Llinás at Carnegie Mellon University, and earned her PhD. in Biophysics/Chemistry in 1999. She then worked as a postdoctoral fellow in the laboratory of Professor Kathryn R. Ely at the Burnham Institute. Klára is a biochemist and structural biologist specializing in biomolecular nuclear magnetic resonance (NMR) spectroscopy. Klára studies proteins that play important roles in human health and disease. Her group uses primarily nuclear magnetic resonance (NMR) spectroscopy, which is a well established tool for structure determination of biological macromolecules and their complexes (up to ~25-30 kDa) at atomic resolution. Larger proteins can be characterized using TROSY-based experiments, paramagnetic relaxation enhancements and residual dipolar couplings, or are conquered by division into smaller structural and functional domains. NMR methods are also used to investigate conformational dynamics and to map ligand interaction surfaces. In addition to NMR spectroscopy, Klára’s group uses X-ray crystallography in collaboration with Dr. Steve Sprang’s laboratory, fluorescence spectroscopy in collaboration with Dr. Sandy Ross’s laboratory, and a variety of other biochemical and biophysical methods. A question of particular interest is how cell identity is established and maintained at the molecular level. Brain, heart or fat cells are remarkably different yet they all start with the same genes. How do different cells and tissues remember what they are, and what keeps them from going astray? Gaining insight into how cell-type specific transcription programs are determined remains a major challenge for life sciences today. Transcriptional regulation and in particular epigenetics (heritable changes in gene expression that occur without changes in DNA sequence) have become an area of very intensive research that has large implications for stem cell biology, development, and various human diseases including cancer. One group of transcriptional regulators that are involved in establishment of cell-type specific transcription programs are the PRDM proteins. Klára’s group investigates the structure and function of several members of this family. Fibronectin is an essential extracellular matrix (ECM) protein. It plays an important role in cell adhesion and migration and affects cell proliferation, survival and differentiation. It is secreted in a soluble form and is converted into the insoluble ECM form by cells. The molecular basis of the conversion of soluble fibronectin into insoluble fibrillar aggregates is poorly understood, and the exact arrangement of fibronectin molecules within fibrils in not known. This is because of limited experimental control over the cellular conversion process, and the difficulties that are associated with investigations of heterogeneous fibrillar aggregates. Klára’s group takes advantage of an experimentally accessible model system that employs a 9 kDa fragment of fibronectin, termed anastellin. Anastellin binds in vitro to soluble fibronectin and converts it to insoluble form that morphologically and functionally resembles fibronectin fibrils deposited by cells. The binding sites for anastellin in fibronectin include the first through third and the eleventh type III domains. To gain insight into the fibril formation process, Klára’s group investigates the structure and dynamics of these domains and the conformational changes that occur upon anastellin binding. Arenaviruses cause hemorrhagic fevers with high mortality in humans. Entry of arenaviruses into the host cells is mediated by the envelope glycoprotein (GPC), which consists of the receptor-binding (G1), transmembrane fusion (G2) and stable signal peptide (SSP) subunits. SSP is essential for intracellular trafficking and maturation of the GPC complex and for pH-dependent membrane fusion mediated by GPC. Klára’s group investigates the structure of the cytoplasmic and transmembrane portions of the GPC complex, with particular emphasis on how SSP interacts with the G2 subunit. Structural biology; biomolecular nuclear magnetic resonance (NMR) spectroscopy; protein structure, function and dynamics. Danielson, T.A., Stine, J.M., Dar, T.A., Briknarova, K. and Bowler, B.E. (2017) Effect of an imposed contact on secondary structure in the denatured state of yeast iso-1-cytochrome c. Biochemistry 56, 6662-6676. Stine, J.M., Ahl, G.J.H., Schlenker, C., Rusnac, D.V. and Briknarová, K. (2017). The interaction between the third type III domain from fibronectin and anastellin involves b-strand eexchange. Biochemistry 56, 4667-4675. Stine, J.M., Sun, Y., Armstrong, G., Bowler, B.E. and Briknarová, K. (2015). Structure and unfolding of the third type III domain from human fibronectin. Biochemistry 54, 6724-6733. Sun, Y., Stine, J.M., Atwater, D.Z., Sharmin, A., Ross, J.B.A. and Briknarová, K. (2015). Structural and functional characterization of the acidic region from the RIZ tumor suppressor. Biochemistry 54, 1390-1400. Thomas, C.J., Briknarová, K., Hilmer, J.K., Movahed, N., Bothner, B., Sumida, J.P., Tall, G.G. and Sprang, S.R. (2011). The nucleotide exchange factor Ric-8A is a chaperone for the conformationally dynamic nucleotide-free state of Gai1. PLoS ONE 6, e23197. Briknarová, K., Atwater, D.Z., Glicken, J.M., Maynard, S.J. and Ness, T.E. (2011). The PR/SET domain in PRDM4 is preceded by a zinc knuckle. Proteins 79, 2341-2345. Briknarová, K., Thomas, C.J., York, J. and Nunberg, J.H. (2011). Structure of a zinc-binding domain in the Juní­n virus envelope glycoprotein. J. Biol. Chem. 286, 1528-1536. Briknarová, K., Zhou, X., Satterthwait, A., Hoyt, D.W., Ely, K.R. and Huang, S. (2008). Structural studies of the SET domain from RIZ1 tumor suppressor. Biochem. Biophys. Res. Commun. 366, 807-813. Derunes, C., Briknarová, K., Geng, L., Li, S., Gessner, C.R., Hewitt, K., Wu, S., Huang, S., Woods, V.I. Jr. and Ely, K.R. (2005). Characterization of the PR domain of RIZ1 histone methyltransferase. Biochem. Biophys. Res. Commun. 333, 925-934. Briknarová, K., Åkerman, M.E., Hoyt, D.W., Ruoslahti, E. and Ely, K.R. (2003). Anastellin, an FN3 fragment with fibronectin polymerization activity, resembles amyloid fibril precursors. J. Mol. Biol. 332, 205-215. Briknarová, K., Takayama, S., Homma, S., Baker, K., Cabezas, E., Hoyt, D.W., Li, Z., Satterthwait, A.C. and Ely, K.R. (2002). BAG4/SODD protein contains a short BAG domain. J. Biol. Chem. 277, 31172-31178. Briknarová, K., Takayama, S., Brive, L., Havert, M.L., Knee, D.A., Velasco, J., Homma, S., Cabezas, E., Stuart, J., Hoyt, D.W., Satterthwait, A.C., Llinás, M., Reed, J.C. and Ely, K.R. (2001). Structural analysis of BAG1 co-chaperone and its interactions with Hsc70 heat shock protein. Nature Struct. Biol. 8, 349-352.